Guildford 's "longest serving" taxi driver, who helped transport terrified people away from the wreckage of the Guildford bomb attack , is to have his licence revoked after taking part in a protest over lower fares. David Williams-Wynn, 79, has been driving the town’s residents and visitors for 44 years but his long career is set to come to an end. The father-of-four, who is chairman of the Guildford Hackney Association, was one of many taxi drivers to take part in a go-slow protest against a 16% cut in their meter rates on March 27. The hour-long protest, which involved cabbies driving slowly around the town centre’s one-way system , is currently being investigated by Guildford Borough Council , which also warned participants they could face disciplinary action. On Tuesday (May 8), little more than one month later, Mr Williams-Wynn was told his Hackney carriage licence will be revoked due to his "traffic offences". The letter sent from the borough council stated CCTV from the protest shows him driving his taxi around the gyratory as part of the protest. It added Mr Williams-Wynn’s car obstructed the road "on a number of occasions" and he parked on 'blipped' double yellow lines outside the YMCA and, as a result, the grandfather’s "driver’s badge must be returned" within 21 days. Daughter Lynne Stewart said she was distraught to hear her upset father tell her his career could come to an abrupt end. "He has been a taxi driver in Guildford for 44 years and was there when the Guildford bombs went off and helped many people away from the blasted area – seeing things no man should have to see," she said. 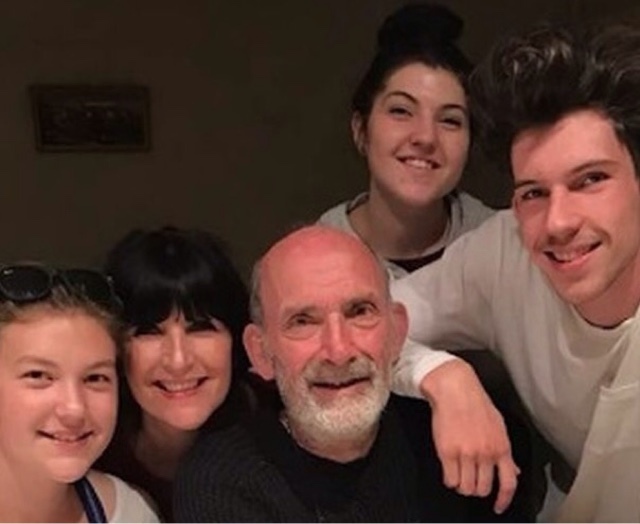 "He has been a hard working man raising his four children in Guildford, one who was a policeman in Surrey for many years and myself, a nurse and midwife. "We have contributed to the Guildford community in many ways, it should not end like this for my dad. I believe in democracy and he surely has a right to stand up for what he believes." One of Mr Williams-Wynn’s sons is also a taxi driver and the pensioner "worries" for his future. Mrs Stewart continued: "Dad was out protesting that day because the council cut their fare rate by 16%. He was not doing this for himself, as he does not have many more years of working, but for the younger taxi drivers and his son who deserve to make a liveable wage. "He is not a criminal or a trouble maker, he is just a man fighting for what he believes in." 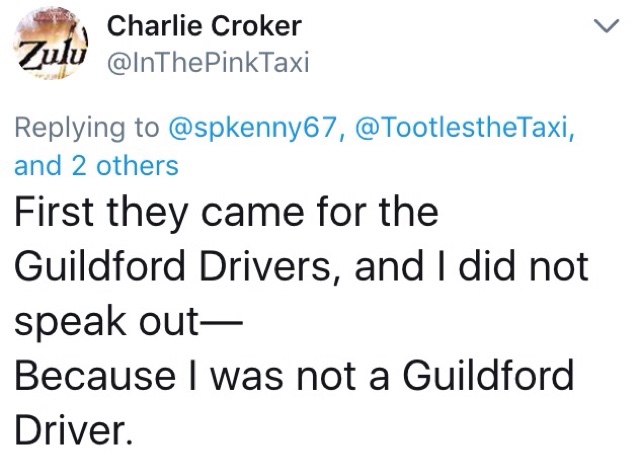 She added: "For the council to revoke his Hackney licence in this way is an injustice to a man who has served the people of Guildford for 44 years. Finishing as a taxi driver should have been on his terms, not theirs." 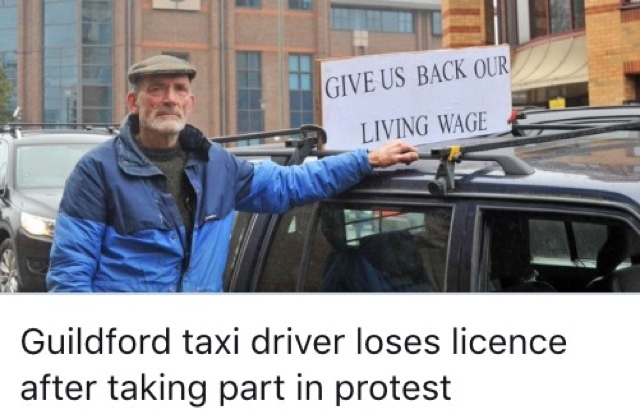 A spokesman for the borough council said: "The council is aware that a number of taxi drivers took part in a protest with their vehicles on Tuesday March 27 in Guildford town centre. "Whilst we acknowledged their right to peacefully protest, we investigated to determine whether any offences were committed, and liaised with Surrey Police where necessary. "As part of the investigation the council considered if conduct of this nature, including preventing other road users from using the highways, was compatible with the relevant 'fit and proper' legal requirements. "As this is an ongoing matter we cannot comment any further on the details." Wonder who Guilford Council would feel with 10,000 odd London Taxis turning up at the next go slow protest. Especially if it was held over a 5 day period on a daily basis. Would the London Taxi trade stand shoulder to shoulder with our provincial comrades?